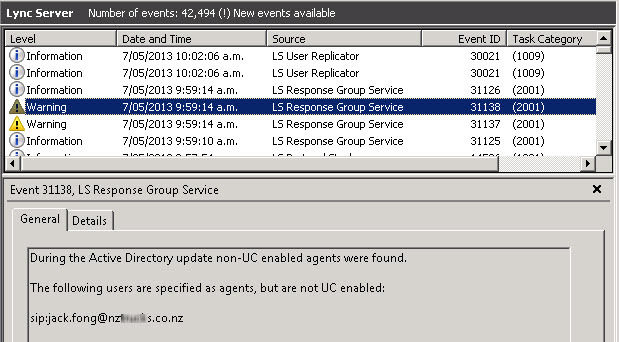 The Response Groups tab does not show any configured Workflows, Queues or Groups. Also I am unable to configure any Response Groups. The Workflows do exist as my first check was to make sure they are visible and I can manage them from PowerShell. So permissions don’t appear to be an issue. Attempting to add a group via the Control Panel I get the message “No workflows are assigned to current manager”. Now that’s cryptic, why does the Control Panel think I am a Response Group Manager? A quick check in Active Directory Group Membership for my account shows that I am a member of CSAdministrator BUT am also a member of CSResponseGroupManager. I am certainly not supposed to be an RGS Manager. The CSResponseGroupManager group only allows access to manage groups that a user has been specifically assigned too. Removing my account from this group corrected the situation and I was able to manage all RGS as expected. If a user was assigned as the group manager, then ONLY that particular group would be visible in the Control Panel. What happens to my Response Group Calls when we have to suddenly evacuate the building? Since the environments I come across most refers here to the DDI’s called to reach said Response Groups I have come up with the simplest solution. Basically I have a Emergency Workflow preconfigured complete with announcement and destination. The Script offers the administrator the option to select Y or N to activate or de-activate Emergency Workflow respectively. If selecting Y, the Script then lifts the DDI from the normal Response Group Workflow and assigns it to the Emergency Workflow. Selecting N reverts the DDI to its original Workflow. Created on:       04/11/2014 8:13 p.m.
a Threshold of 0 (meaning that any calls will overflow immediatly. or to a UM enabled mailbox (Voicemail). Write-Host "Select one of the following options (Y\N):"
$a = Read-Host "Select Y or N: "
Found the error by taking the SIP address from the Event and looking for the user in the Lync database, thats when I noticed it had changed. Seems Johan came across the same issue before and so here is how he has helped me find the issue.. Warning: the procedure described in this blog are used as a workaround for an issue. Incorrect changes in the database may cause malfunctioning of the Response Groups. 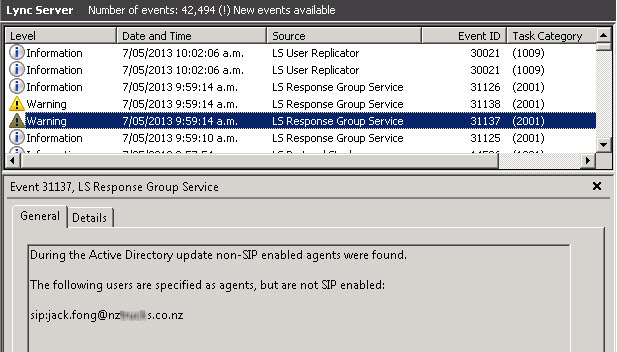 In Lync 2010 it’s possible to add users to a group which can be used by the Response Groups. In some scenarios it might be necessary to remove and directly add an agent. This can be the case if a SIP address of a user needs to be changed. Cannot insert duplicate key row in object dbo.Agents with unique index IX_Agents_UserSid. This error will tell you that it can’t add the agent because there is an existing entry in the agent table which is used by the Response Groups. Normally you will have to wait a few minutes before you can add the user again. But this week I experienced that after 3 hours the agent still can’t be added to the group. In the event log nothing strange was being logged. On TechNet you will not find many information how the Response Groups really perform this action. But in some cases it looks like the Response Group will be resetted after making a change and it only resets the Response Group if it is idle. Because I couldn’t add the user after 3 hours it became quiet irritating. As you may know Lync is using SQL databases. The agents of a Response Group are added to the rgsconfigdatabase. This database can be found on the SQl server which also hosts the CMS. Within this database you will find a table called dbo.Agents. When you will open this table you will see an overview of the agents which are member of the groups. By removing the record it will be possible to add the agent to the group again.